Hi Grizz, welcome to Aside from Writing, we’re very excited to have you here today as you’re not only our first character interview on the blog, but you’re also the first bigfoot we’ve ever met. Can you tell us a little about yourself and what life as a bigfoot is like? First of all, allow me to greet you and your readers formally. If we were meeting in person, I would hold out my hands to show you I held no weapons, then I would speak the word of peace, Donovthosameezu.” It’s a “footese” word meaning, “I am not a child.” The inference is that because I’m not a child, I will not try to kill you. Our children are exceptionally violent. Now to answer your question. The whole “bigfoot” thing is a human term, of course. We do have large feet compared to humans, but that’s because we range from eight to twelve feet tall. There’s also a misconceptiont that we are some class of primate, but we aren’t. We don’t really even resembled them. I’ve been told that we look more like bears, actually, though that’s coincidental, since we’re not from Earth. The popular legend of “bigfoot” is based in truth. Our footprints have been discovered several times, and some of the film/video footage is authentic. When we are on the surface—which is very rare—we dress intentionally to promote the wrong ideas about us. We even wear masks to do, in fact, look more ape-like. The last thing we want is for humans to discover our true nature. Obviously, we don’t think of ourselves as bigfeet any more than you think of yourselves as “little feet.” We refer to ourselves as the People in our language. Most of us live in the city of Undermountain, deep beneath the Canadia Rocky Mountains. There are small settlements beneath the Himalayas, the Alps and a few other places. The thing humans would find most surprising is that all of us take an oath of nonviolence when we reach adulthood. This is not an oath to be passive in the face of attack, however. We can and do defend ourselves if needed. You’ve met a number of humans in your life – what do you think of us really? I’ve met five of your teenagers, and I was extremely impressed with their resourcefulness and resolve amidst extremely dangerous circumstances. I’d like to think those five would consider me a friend now. In truth, I was a bit overwhelmed by their emotionalism at first. In general the People see all humans as children due to your proclivity for violence. That, and your hilariously backward technology. LOLhumanz is a popular meme going around right now. There’s a popular TV show running in the North America right now called “Finding Bigfoot.” It’s the funniest thing I’ve ever seen. Bigfoot society is much more technologically advanced than our own, are there any gadgets you have that we would really like? You’ll understand, of course, that I cannot speak in too much detail about our tech. The main reason we stay in hiding is because we don’t believe your civilization is ready for our technology. We’re concerned the first thing you’d do is reverse engineer it and make weapons. Do you have bigfoot writers? And if so – what do they write about? I’ll let you in on something very intereting about life in the galaxy. Every intelligent species we’ve found tells stories. Well, every one except the tangoga, but they’re a special case, so forget them. Anyway. We have a rich tradition of story, though the most popular tales tend to focus on a race called the Asht, who are now pretty much extinct. Unfortunately, we do not know the whole history of our rise as a species and our ascension to travel among the stars. This has led many to concoct legends to fill in the gap. In fact, most new stories we write are set in the time prior to the oath. What are your favourite things about being a bigfoot? The sport of deshuk. It’s based upon ancient martial art of the Asht, called deshuk-lan. We’ve adapted it into a team sport. It involved three teams on the field at once. In fact, whenever I watched human sports, I always wondered why there are only two teams on the field at a time. The fact that there are no females of our species on Earth. There are very valid, practical reasons for this arrangement, but knowing them doesn’t make it any easier. We’ve got some random questions for you now about books – hopefully you’ll have read enough human stuff during your socialisation training to be able to answer them. It’s a tie between Mr. Darcy and Gandalf the Gray. The first is an arbitrary choice. You could put any leading, male character in that slot. I’d like to experience romantic love the way humans do. It sounds quite powerful. The second character is related to the answer for the next question. I’ve always been intrigued with your so-called fantasy genre. The idea of magic is so outide the experience of the People that I’m fascinated by it. I’ve chosen Tolkien’s Middle Earth for this one. I’d like to have dinner with Samwise. I imagine he’d love peanut butter as much as I do. Rasheed from A Thousand Splendid Suns. I don’t even want to discuss it. Just the thought of him raises my hackles. Thank-you for taking time to talk to us today! If you’d like to know more about Grizz and being a bigfoot then follow him on Twitter. 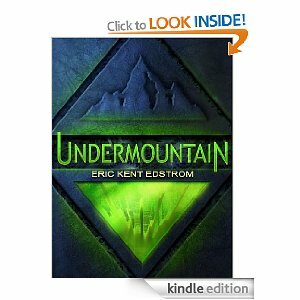 He also stars in Eric Edstrom’s book Undermountain available now. This entry was posted in Character Interviews, Interviews and tagged bigfoot, eric edstrom, fun, interview, undermountain. Bookmark the permalink.